It is officially March—my favorite month for birthdays and basketball! This year is destined to be the best March ever. We are all gettting better not older, right?? 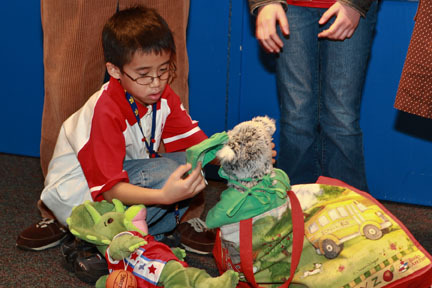 As most of you know, one of the reasons I started Build-A-Bear Workshop was to be able to give back to others. I have always believed that good people, doing good work, with a good heart, will reap great rewards. I have been so fortunate in my career to have been given great opportunities and in my life to have met and developed friendships with so many wonderful people. Build-A-Bear Workshop and St. Jude Children’s Research Hospital are beginning a wonderful new partnership. Starting this month, we will roll out “Cause for Celebration” parties at Build-A-Bear Workshop where our Guests can be a party hero and make a beary big difference in the lives of the children of St. Jude. I always listen to our Guests. Many of the company’s best ideas have come from them. About six years ago, we had a writing contest. A young woman and one of our dearest BABW friends still today named Kelsey Sheifen won the contest and her prize was a trip to New York City and a chance to go to the Macy’s Thanksgiving Day parade. At the time, Kelsey was battling cancer and she was a patient at St. Jude Children’s Research Hospital. Partly because of Kelsey, we learned about St. Jude and the amazing work they do. It was the first of many subsequent stories that we heard about this place where kids with life-threatening diseases are cared for with the most advanced forms of medical treatment. This past January, I had the incredible opportunity to visit St. Jude Children’s Research Hospital located in Memphis, Tennessee. I toured the facilities, talked to some of the best doctors in the world, and met inspiring families who had traveled near and far with the same goal in their hearts- to go home cancer free. I was deeply inspired by one family that I met. This young patient, Anthony, was a huge Build-A-Bear Workshop, fan and had received our stuffed animal friends throughout different stages of his treatment. In his eyes, I was a celebrity. But to me, he was a superhero. 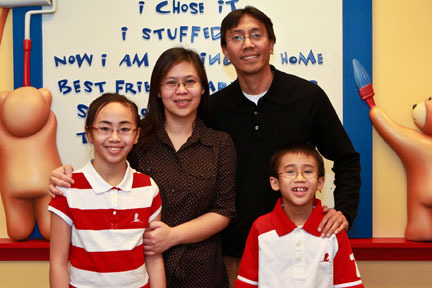 Despite a challenging diagnosis, he still had courage in his eyes and hope in his heart due to the world class care and treatment he is receiving at St. Jude. The healing hugs of his Build-A-Bear Workshop furry friends of course helped a lot, too. In this young man, I saw what a difference a teddy bear hug can really make. I know Anthony will have a long and prosperous life because he values every single day! Our partnership with St. Jude was inspired by our Guests’ passion for giving. When a Guest books a “Cause for Celebration” party, they will make a ten dollar donation that will support life-saving research and treatment at St. Jude Children’s Research Hospital. In addition to the Guest’s $10 donation, Build-A-Bear Workshop will give a St. Jude patient a gift card to experience the fun of making a new furry friend for themselves. After all, we’re experts at providing teddy bear to children in need of a hug! Each party attendee will sign a special St. Jude card that will be sent to a St. Jude patient. That card will help cele-bear-ate a patient’s completion of treatment or reaching a treatment milestone. Party attendees will also receive a sticker to remember the occasion, and the Guest of honor gets a bear-sized tee shirt that says “I helped the children of St. Jude” for all the party attendees to sign. Build-A-Bear Workshop Guests in the United States will be able to make a donation to St Jude Children’s Research Hospital when they check out in stores or online at buildabear.com throughout the month of March, and Guests in Canada will be able to make a donation by purchasing a purple satin heart. I am so thrilled about this new partnership and to provide even more hugs to children in need. We have the power to make a difference in the lives of so many children. You all know how much I love birthdays and no matter how much older I get, my birthday is still a special day for me too! A few years ago I celebrated my birthday by having all my gifts go to classrooms through donorschoose.org. This year on Monday March 7, I celebrated my birthday at our New York Fifth Avenue store with my friend Marlo Thomas, daughter of St. Jude founder, Danny Thomas, and the spokesperson and national outreach director for St. Jude. Together, with local children and some very special young guests from St. Jude, we will announce our partnership to the world and our NEW party program. I have always believed in sharing and helping others – I learned about this from my parents at a very young age. Encouraging the next generation of givers and empowering them to make a difference starts at home. I encourage parents reading this to turn their child’s next birthday party into a “Cause for Celebration”. Show them how good it feels to help someone else! Moms want easy ways for their kids to learn to share, give back to give back and make a difference, and kids want to help other kids. “Cause for Celebration” parties are not just for birthdays. There are hundreds of reasons to celebrate . If your child’s class or scout troop or even your work team is looking for a way to give back, a “Cause for Celebration” party would be an incredible experience and memory for all. Or if you know someone who has accomplished something special, whether adult or child it can be a cause to celebrate. So – surprise someone with a celebration for life and help the children of St. Jude! One thing I have learned from my friend Anthony is every day on this earth is a cause for celebration! Anthony and his furry Koala friend. You are currently browsing the Maxine Clark's Blog blog archives for March, 2011.